I have to thank my mother for having great taste and personal style – whenever I’m in Austin I always borrow something from her closet, whether it’s a jacket, clutch, jewelry or shoes. I mean, she really does have better stuff than I do! On my trip to Austin this past weekend I had very little time to pack, so as you can imagine I forgot a lot of stuff (mom’s closet to the rescue)! 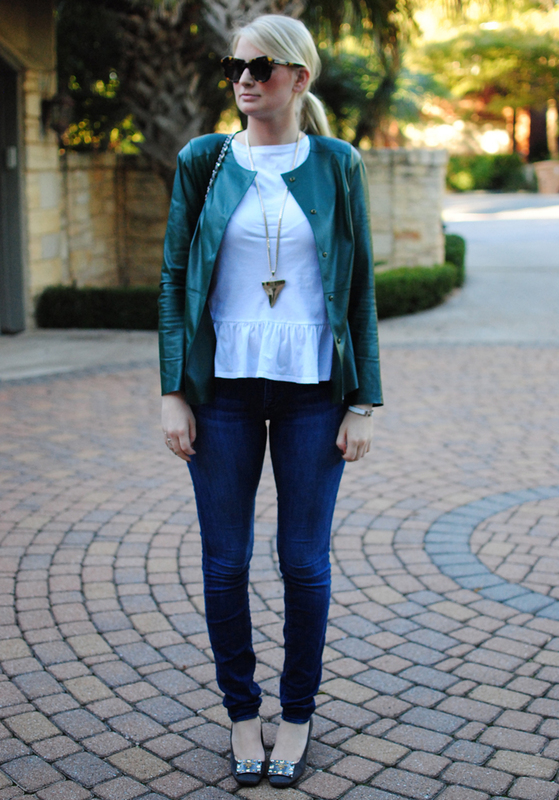 All I had to wear for Friday night was this ASOS peplum tee (my favorite basic) and some jeans. 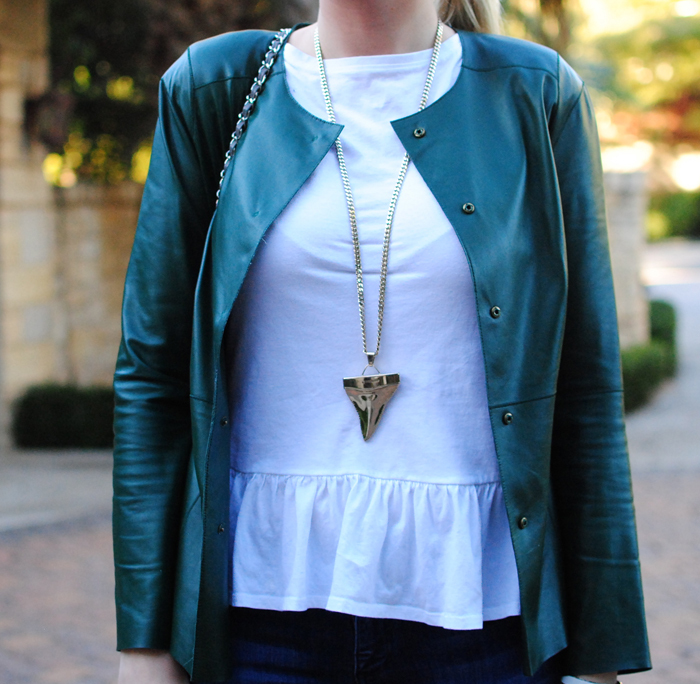 I scoured her closet for some fall trends to complete my look and found this bottle green leather jacket by Ellen Tracy and these Prada shoes from several seasons ago that I am still in love with. Topped the look off with my Givenchy shark tooth necklace and Chanel purse and voilà, Friday night! Whose closet do you like to raid when you’re home? Oh my goodness – I can’t believe these are your mom’s! My mother is not into fashion at all and so behind-the-times…I wish I had a fashionable relative I could snag designer pieces from! Wow, I wish my mom’s closet was stacked like that! You look really cute. I do the same thing with my mom’s closet. And luckily, after a few seasons, she’ll rotate things out & hand them over to me… I’ve got my eyes on her collection of Equipment blouses & Chloe handbag… :) great outfit!